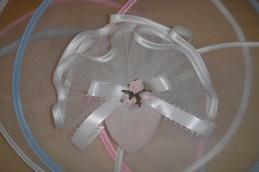 9" Tulle Rounds with HAND sewn borders. Just beautiful. We recommended doubling them up for a full, elegant look. This sample is shown with two nets. Please keep in mind that the netting is always white in the middle, even on the ivory satin edged circles.